Headphones. The things dreams are made of… that is if you work, have or are ever around children who love to binge watch YouTube videos or play extremely loud music. Imagine this: You come home from a long day of work and before you even enter your front door, you hear loud thumping music coming from your teenage son’s bedroom. The minute you finally get inside, you are cut off by your 9-year-old daughter who is glued to her phone watching videos, volume full blast, not looking where she is going. When you get to the kitchen, your 3-year-old zooms past you, tablet in hand, Caillou’s ear-piercing voice blaring through the speakers. Forget your peace and quiet, this is what you’ve got! Now imagine this scenario but add one magic ingredient: HEADPHONES. You come home from a long day of work and before you even enter your front door, you see your teenage son in his bedroom, headphones on, listening to music. The minute you finally get inside, you are cut off by your 9-year-old daughter who is glued to her phone watching videos, not looking where she is going, but nice and quiet. When you get to the kitchen, your 3-year-old zooms past you, tablet in hand, but silence ensues instead of chaotic, whiney voices. You’re able to settle in with a glass of wine on the couch in pure silence! That’s when it dawned on me: HEADPHONES! I went in the headphone bucket, got a few hooked up to an amp, eliminated the guitars and any other instruments that could not be plugged in, turned off the main speakers, handed out headphones to each student, plugged them in and then it happened… complete… utter… silence. All that could be heard was the light tapping of drumsticks, the pressing of keys on the keyboards, laughter and the sound of smiles. Each child was able to immediately hear exactly what he or she was playing. Their instruments were no longer being drowned out by the others over playing. They were happy and content with their headphones. And believe me, so were we! Now let me clarify something before you go out and buy a million pairs of these things: Headphones are very different than earbuds. 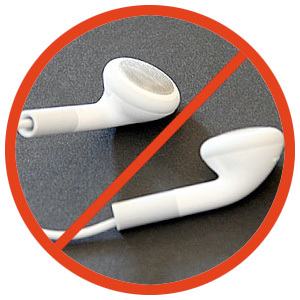 Earbuds are the things that come with your apple product and are said to damage the ear drums because they go deeper into the ear canal. Headphones encompass the ears and allow the sound the vibrate around the outer ear as well, not just the inner ear. So if you plan on getting your students or your own kids headphones, make sure they are actual headphones that cover the entire ear. You can buy cheap ones at the dollar store, or you can invest a little money in some more sturdy, durable, higher-quality headphones. So here is the challenge: Find a situation in your day and add some headphones to it! Whether it’s buying a pair for your kids, yourself, your students or a co-worker, make it happen and bring the peace back to your environment that you know you deserve! Let us know in the comments below how you've been able to use headphones in your environment to provide a more therapeutic atmosphere!